It's a big win in a big test for the black vote on the Democratic side. Multiple news outlets are reporting that former Secretary of State Hillary Clinton has handidly won the state of South Carolina over her rival, Vermont Sen. Bernie Sanders. At the time of publication, Clinton had won South Carolina by an overwhelming 77 percent compared to Sanders' 23 percent. 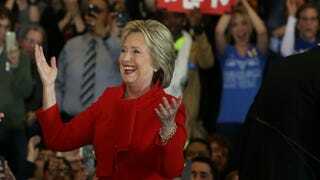 Clinton was expected to win in South Carolina based on the strength of the African American electorate there, which voted overwhelmingly for the former first lady and senator after rejecting her in 2008 when she lost to then Sen. Barack Obama. Exit polling out of ABC News found that as much as 84 percent of the black vote went for Clinton. Echoing Republican front-runner Donald Trump's catchphrase in her victory speech, Clinton said, "We don't need to make America great again, America never stopped being great. But we do need to make America whole again. Instead of building walls we need to be tearing down barriers." While only 59 delegates were at stake in the state, South Carolina was considered a bellwether of the black vote. How either candidate performed in South Carolina could be an indicator of how they would do with African American voters nationally. The win for Clinton is huge heading into Super Tuesday, March 1, where several states will hold primary elections. Before winning South Carolina, Clinton narrowly won Iowa, then lost handily to Sanders in New Hampshire before winning again, decidedly, in the Nevada caucuses.